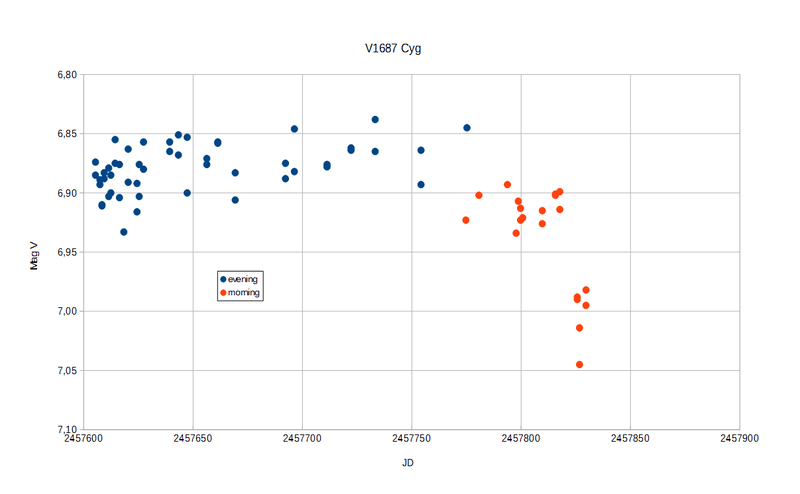 AAVSO Alert Notice 546 announces a multiwavelength campaign on the bright (V~6.7) Wolf Rayet star V1687 Cyg (WR 140). Please see the notice for details and instructions. According to VSP here is currently no sequence for this target. Has there been one requested? Could we get notice here when a sequence is posted? Thanks for the info! I thought the sequence was in place - I thought we were set, but I did not double-check before sending the notice. My apologies! We'll post here when the sequence is in place. There is a sequence, but you need a C scale chart. Nothing of appropriate magnitude is closer in. Thanks, Tom - I _thought_ it was in place! This star is so bright that the scales many observers are used to using are too small. Observers should use a 'C' scale (120 arcmin field of view) as Tom recommends or larger ('A' at 900, 'AB' at 450, 'B' at 180). I'd like to suggest that it may be worthwhile to add this star (along with the suitable comparison and check) to the PEPV observing list. Its a little on the faint side for PEPV but its worth a shot for most PEPV observers. And that may increase the number of electronic observations since the 'C' scale 120 minute field is a little big for most CCDs. can we use the blue channel? dealing with extinction issues, as the target will be closer to the horizon at night during coming months. The target, WR 140, is certainly bright enough at 6.8 mag (V) to be observed with small apertures. Because it is so bright, it's convenient to have a wider field to get a reasonable choice of comparison stars. The setup I'm currenrtly using is this: Canon EOS D1100, legacy lens smc Pentax 1:2.5/135, static tri-pod, batches of 5sec exposures. It's a crowded field there in Cygnus so you probably don't want to use a much smaller focal length than that. It's also a very interesting target at a crucial stage in it's binary orbit phase (nearing periastron passage), which happens only every ca 8 years. I expect some high quality photometry (also PEP) being reported for this campaign, so even if you as a DSLR observer don't feel confident enough in your result yet to report them, it should be a good place to compare and validate your experimental results. To give you an idea of the field thru a DSLR telephoto lens from a moderately light-polluted suburban observation site, below is a cropped and scaled by 1:2 image (after co-adding 25 exposures of 5 sec, here the blue channel, in AIP4WIN). 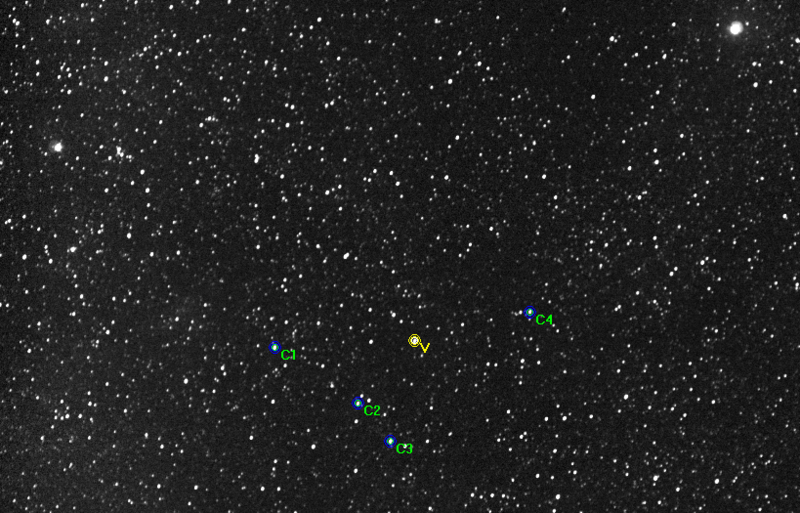 North is in the bottom right corner, the very bright stars in the top are, not surprisingly, Sadr and Deneb, which make excellent field finding guides because you can easily see them in the camara's live view with this kind of optics. Since multi-wavelength observations are key for this campaign, I decided to have a quick look at whether the DSLR's Tri-color Blue channel might be useful for this particular campaign. So the first thing that seems reasonable to check is the correlation of the differences of the instrumental magnitudes of the Tri-color Green and Blue channels and the catalog (B-V) values. For this particular choice of comparison stars (and maybe I was quite lucky with this choice), the correlation is strikingly linear, see the spread sheet screenshot. The x-Axis is the (TB_inst-TG_inst) "instrumental color index", the y axis is the catalog (B-V) color. The numbers in the left upper corner are (left column) the thus measured (transformed) comparison star B magnitudes, and the deviation from the catalog B magnitudes (right column) respectively. 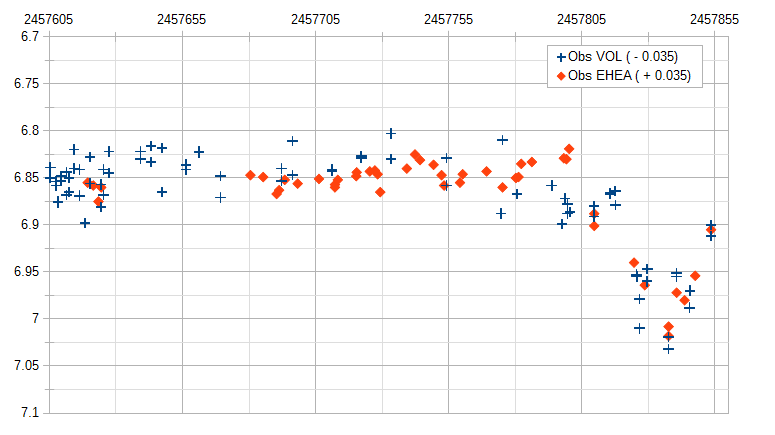 (The B-V catalog errors for the comparison stars given in the sequence are around 0.03 or worse). Using this to derive the target star's B magnitude, I get values that are in good agreement with what other observers have measured so far, so I think this is at least good enough to see how the coming periastron passage might affect the V and B filter bands separately. I am currently observing WR 140 doing CCD-photometry (B, V and R filters) with a small refractor, but I have also the problem of lack of comparison stars, because my set-up only covers a field of 1,9ºx1,2º. If we look at the paper "The Astrophysical Journal, 596:1295–1304, 2003 October 20", we can see that the autors used HD 193888 (A0; B=8,48; V=8,51; R= ¿? 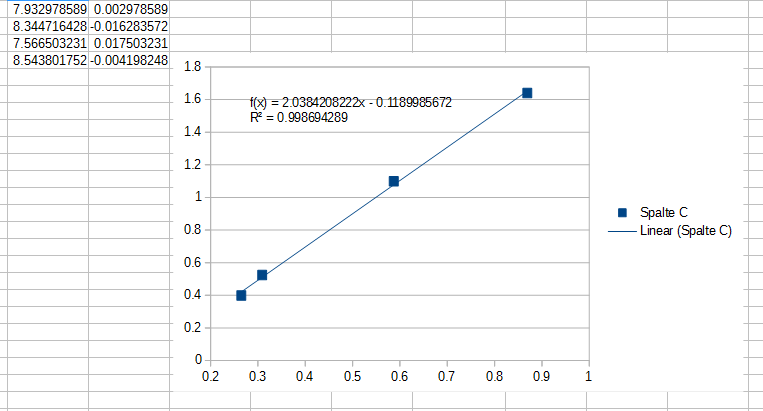 ; according to the information showed in SIMBAD database) as comparison star and HD 193926 (B=7.84; V=7.84; R=¿?) as check. However, I don't have any information about the R magnitude of these stars. 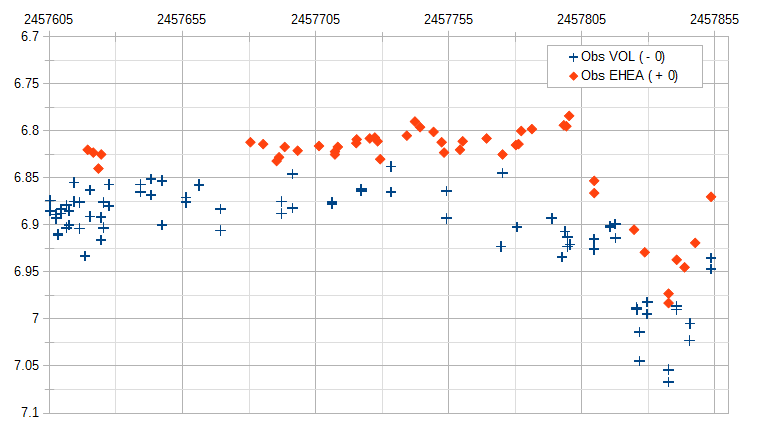 Anyway, the AAVSO sequence lacks of good comparison stars for small fields. The closest star, 000-BLY-552, is near the edge of the image and I have only the V magnitude. For my set-up I would prefer to use HD 193888 and HD 193926. Or better, HD 193632 (brighter and closer to WR 140). Do you have any suggestions about this? Where can I find the B,V,R magnitudes of these stars? I believe that results will be better if we work with the same stars and magnitudes, if possible, of course. HD 193632 would also be close in color. (as far as the argument goes for an unresolved binary). The new Gaia data also only has V(T) and B(T) magnitudes, right? For more than one month, I've been the only one submitting non-visual measurements for this campaign, at least as far as I can see from teh WebObs search. This is a bit unfortunate, I live in a part of Germany that isn't exactly known for clear skies. Are others planning to resume observations later on, e.g. in January to April 2017 which is the expected time-window for dust-occulation to happen? I was doing BVR photometry up to November 9th but, due to the lack of a good photometric sequence, I decided to change photometry by spectroscopy. If necessary I could resume photometry but it's difficult do photometry and spectroscopy at the same time. Anyway, the spectrum profile is already changing. Here you are a comparison of two spectra: the first one taken in October and the late one, in December 23th, only five days after WR 140 periastron. Interesting stuff. I'm sure we will see more change in the coming months. So it's also not yet too late for new observers to join this campaign, as I wrote earlier in this thread this target is ideal for wide-field DSLR photometry with a telephoto lens. Thanks for trying to get some photometry and for some spectroscopy Fran. (Contact me at noel <dot> richardson <at> UToledo <dot> edu, and we can include them in the spectroscopic analysis. As for the photometry, we are near crunch time now, although it is not an ideal target at this point. The lack of comparison stars is frustrating, but using the ones from Marchenko et al. would be fine. The near-infrared brightening has begun, which was caught by a European observatory. We should see the optical occultations any time now. Thanks in advance. For me here (northern Germany) the limiting aspect currently is the weather. I might get a chance for clear skies later this week. As far as I can see, dimming in V band hasn't started yet (as of yesterday). Unfortunately it looks like bad weather for most of next week, so I hope others will have a chance to keep up the observing. Good luck. Finally clear skies in Germany again. This is getting hard, quite close to the horizon. No sign of dimming yet as far as I can see. I've just reported (after a weather-forced lengthy observation pause) the dimmest mag for WR 140 I ever measured, so normally I would think that dimming might be happening now. Unfortunately this coincides with me changing from observing in the evening (it's just to low now) to observing in the 0-dark-hundred early morning. This changes extinction effects and also rotated the image on the sensor, so there might be a systematic bias. I think I can see this sort of bias at work with measurements of another observer, VOL, who conveniently tho made two such measurements within 24hrs, one at 2017/01/21 16:52:54 (mag_V= 6.845) and one at 2017/01/21 05:13:03 (mag_V= 6.923): note the magnitude difference (0.078) exceeds the reported uncertainty of each individual measurement. So my measurement could be subject to the same effect. OTOH I would trust my newest measurement more than the high air mass evening measurements I had done until now, so I'm inclined to suspect that dimming might have started for real. Weather forecast doesn't look great over here. Sigh. Finally a short gap in the clouds this early morning ... horrible weather so far in March over here. And yes, Vmag now measured at 6.9 or a full 0.1 fainter than what it used to be. Not much redder tho, as far as I can see with a DSLR blue filter. I observe V1687 Cyg with a DSLR (Canon 450D), short telephoto (1:2.8 f=75mm) and undriven exposures (10sec at ISO 800). There really seems to be a difference between the evening and morning observations which probably is due to differential extinction. My last observations indicate that some dimming in the last few days is probably real. Every data point in the diagram is the average of 10-20 images measured with Muniwin software. Blue points were made in the evening, red points in the morning sky. Nice observations, which seem to confirm the dimming in my own obs. Conditions were not great lately so I feel much more confident now that two observers see this. The weather forecast over here is horrible!! The next obs opportunity for me will probably be not before Wednesday :-). It would be great if more obeservers from different countries join this campaign. Even with some haze, I got quite consistent data this moning and the depth of the dimming in V seems to have reached almost 0.2 mag. It looks like WR 140 is past the minimum of the current dimming episode. I think (from previous cycles) there can be more than one such episodes per orbit, so as the alert notice mentioned we should continue to have our eyes and lenses pointed at WR 140 for the comming months. I tried to match the lightcurves (V band) of Wolfgang Vollmann (VOL) and my own (EHEA) (by eye, focusing on the last few weeks when we were both making early morning obs), the plots below show the raw data points and the data points shifted assuming we are 0.07 mag apart by a systematic offset, respectively. I'm having the same problem. Can someone help me? Thanks! I was looking at the previous photometry in the post-periastron stages (Marchenko et al. 2003, http://adsabs.harvard.edu/abs/2003ApJ...596.1295M), and did a quick comparison with the B-band data in the database. There are quite a few differences in the dust absorption this time. 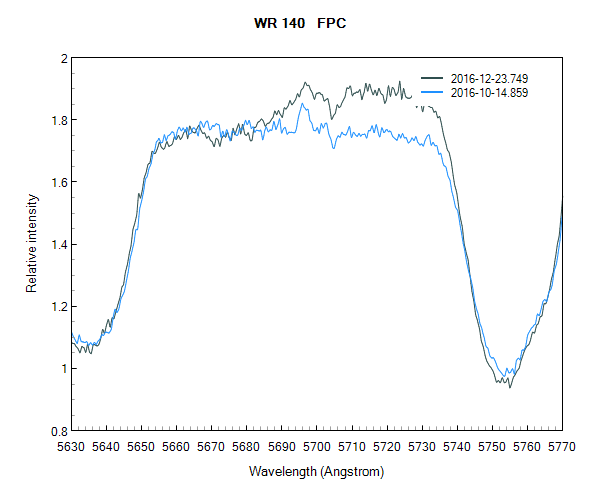 Most aspects of WR140 repeat very well from one cycle to the next, including the infrared light curve from dust emission. This probably points to different formation regions for the optical eclipses and the colliding winds dust formation. We're very excited to see more data coming in through the next few months so that we can figure out this phenomenon. The figure shows the Marchenko et al. photometry from 2001 in black, and the recent photometry in red. Thanks for the the heads-up! It's interesting to see that this "clockwork" CW binary has some surprises for us after all. The weather is not very friendly to astonomers where I live at the moment, but hopefully I'll be able to reduce some images I took early this morning between clouds ...and then perhaps some more later this week. EDIT: BTW, when it comes to comparing my data points to historic data, I would trust the V-band data more than the B-Band data. Both bands were derived from the my DSLR's Tricolor-G and Tricolor-B filter measurements respectively, but the green filter is far closer to the Johnson V than the blue to Johnson B. The transformation works great for stars with a Planck like spectrum, but WR 140 of course hasn't. Good to see that Wolfgang Vollmann (VOL) is still with the campaign (greetings), for a few weeks I was a bit concerned that I was the last one submitting data for this campaign. Also the new tool to list stars in need of observing might attract new submissions. The observation request asked for observations at least until August 2017 IIRC, so this is still worthwhile.